Barney Sterzing founded Sterzing's Potato Chips to supplement his candy business during the Great Depression years of the 1930s. The chips are unique, in that they are still made the same way today. The process is straight forward, and so are the ingredients. The potatoes are sliced before being cooked slowly, one batch at a time. The ingredients are potatoes, oil and salt. Nothing additional is added and no flavor is taken away. It is the recipe and potato chip manufacturing techniques that makes Sterzing's the best selling Potato Chips in South East Iowa. Every time you buy a bag of Sterzing's potato chips you are in reality tasting a bit of local history. The Chips are still "Made Fresh Daily" so customers can rely on the quality they've grown accustomed to. 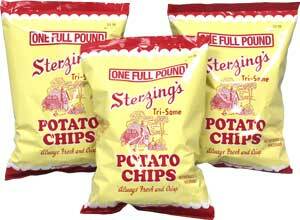 Sterzing's ships Potato Chips all over America and other parts of the world. Their international shipping program began during the Vietnam War when servicemen requested shipments of the chips they grew up eating. Presently, the company are proudly despatching boxes of chips to servicemen and women in Iraq and Afghanistan. Sterzing's are still a family owned and operated business and are currently on their third generation of Chip makers. 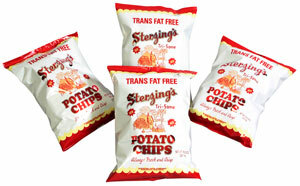 To comply with modern trends and health concerns, Sterzing's have included Trans Fat Free to their stable. The same cooking process is carried out but the Chips are cooked with Low Lin Soybean Oil. A different cooking oil means there is a different flavor. This is the first time that Sterzing’s has added a new product to the Sterzing’s line since 1933. The flavor reminds many people of the national brand.